We're down to the final three here, and they're all within a two-block range. Three very different stores, though. 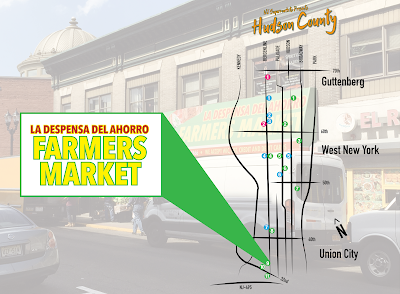 The first spot we're going to check out here is La Despensa Del Ahorro Farmers Market, a two-store chain with another location in Elizabeth. The Elizabeth store is located on Elizabeth Avenue, which is not unlike Bergenline. I've been back to this neighborhood several times since this original visit, and not once could I get a picture of this store without trucks in front. As much as I like these Sprinter vans for deliveries, they sure do block out a lot of what we're trying to see here. 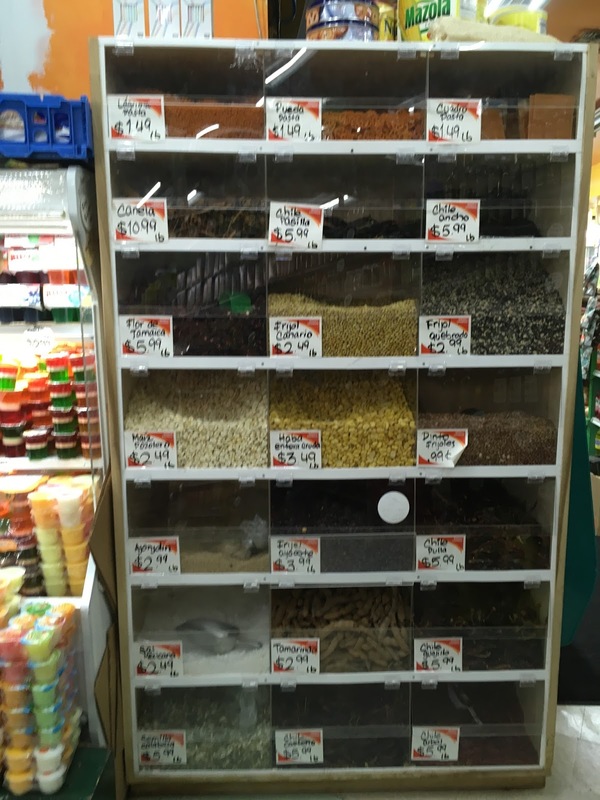 Over on Flickr, for the Elizabeth store, dahillz67 has informed us that La Despensa del Ahorro, or literally The Dispensary of Savings, translates figuratively to The Pantry of Savings, since despensa is used to mean pantry. This particular Despensa was previously James Farm Market & Deli. It may or may not have had any services other than produce and deli. However, Despensa now has a butcher and a seafood counter as well, along with a fairly complete selection of groceries. Inside, we see what looks like your typical urban greengrocer. Messy, cluttered, ridiculously low prices, extremely fresh products. There are a few cases of produce around this section, with the checkout on the other side. Looking over the mounds of root vegetables towards the checkouts. The grocery selection continues behind produce, with butcher/deli and even a small seafood section along the back wall. 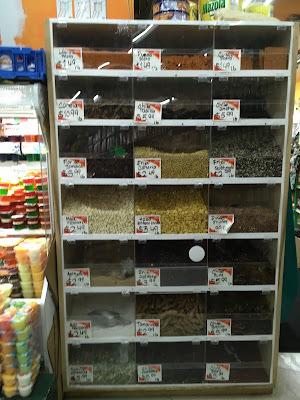 Bulk foods bar, of course. The back of the first aisle, with dairy on the right-side wall and meat along the back wall. And can you find an element of a chain supermarket that made its way into this store? If you guessed the aisle markers, congratulations! They are former Food Basics aisle markers that are probably from the former North Bergen store, just on the other side of 495. While it's tempting to say they came from the 2015-2016 conversion to Food Bazaar, these aisle markers are actually not what the store closed with as Food Basics. They were from the previous decor package, so they were brought over at some point before Food Basics closed, probably ca. 2005. Very complete selection of groceries in such a tiny location. Looking up towards the produce section here. The dairy and meat cases have those annoying clear plastic strips hanging from the front. While I don't like them, I bet it's a real energy savings for the store. And a small operation like this probably doesn't have the resources to replace its cases with closed ones. The last aisle, opposite the entrance, is labeled 1 for some reason. And if you thought NSA in New London was bad, check out that case on the left! This was the only disappointing part of the store. Surely they could come up with something better to do with this case. Or at least keep the merchandise in it organized. The rest of the frozen foods are in the last aisle (aisle 1). There are two registers and a customer service counter in the front. Despensa is a typical urban greengrocer-plus. 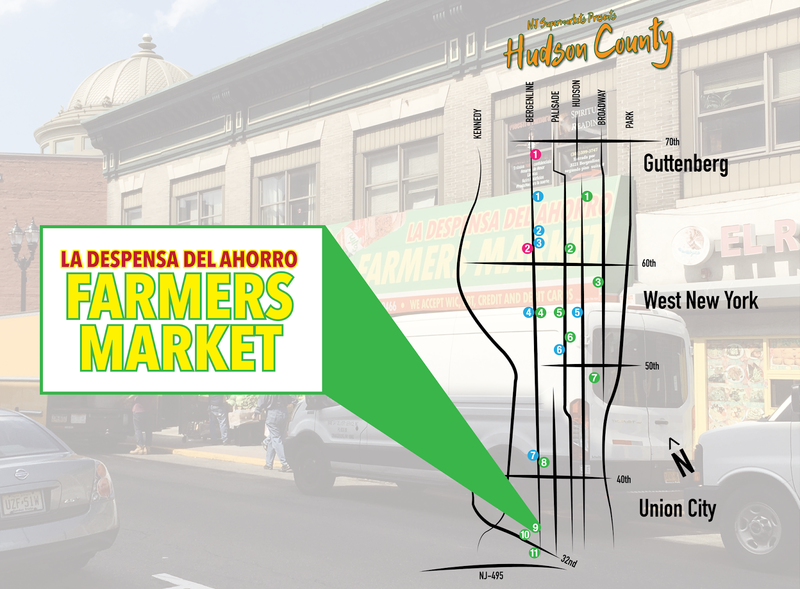 While you're obviously not going to be doing major shopping here, it's a solid corner store with all the basics and great fresh produce.